Tarping a load to protect it during transit is hard work. It can be dangerous too. 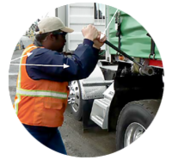 Every year many Washington state truck drivers fall and are injured while tarping and untarping loads on their trucks. 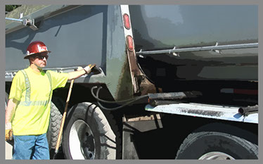 Heavy tarps, uneven loads, wind, rain, and ice increase the risk of falling. 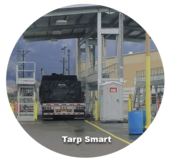 How does one safely manage tarping without falling? This course teaches prevention of common upper extremities due to improperly lowering a landing gear. 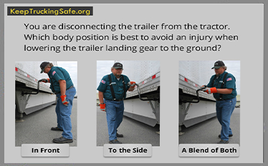 See which body position is best to avoid an injury. 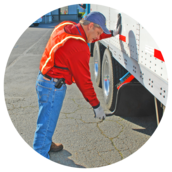 Chaining up a big rig, is by no means one of the fun things about being a truck driver. However, it's a handy skill to know. See if you can spot the differences between drivers.